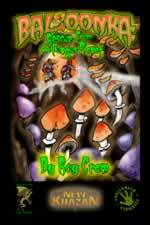 Requires Tunnels & Trolls rules published by Flying Buffalo or Fiery Dragon for use. 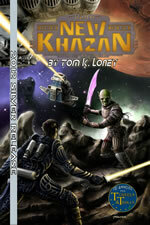 Parts one and two of the Quest for Trollstar epic for New Khazan are now available in PDF format. Click below for more information. Cloudbusting (PDF) - $1.50 - A signal from the ancient homeworld of all the species of the 9,000 Worlds? It simply cannot be. But there, in front of your eyes, on the eye-corder is Kharrrghish script. 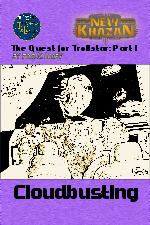 Could this be the key to finding the mysterious and ancient Trollstar? Glow World (PDF) - $3.50 - An ancient signal from a world devastated by loose magic and radiation! Could this be all that remains of the legendary Trollworld? 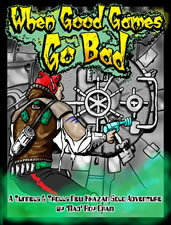 When Good Games Go Bad, Roy Cram's solo adventure illustrated by Jeff Freels. 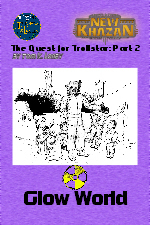 From the author of Gamesmen of Kasar, this solo adventure is set on the planet Bollux IV in the same fun but lethal spirit as that classic adventure. For more Tunnels & Trolls adventures, check out Elder Tunnels, Peakvale, and Trollhalla Friendly! All content (including but not limited to stories, games, other text, and graphics) is Copyright © 2010 by Peryton Publishing or the original author, and may not be reproduced without prior written permission. Peryton Publishing and the Peryton Publishing logo are Trademarks of Peryton Publishing. All Rights Reserved. Email open@perytonpublishing.com for more information.